You probably want a quiet dishwasher. You can buy a quiet dishwasher for under $700. So why spend more? The high-end models have unique features that are worth considering. 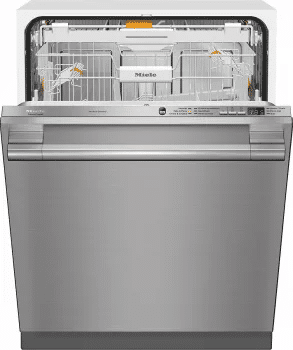 We will look at these special features and the best dishwashers over $1000 to help you make your choice. Distinctive features at this price point include greater flexibility, such as foldable tines and a 3rd tray to fit more or to focus on clean cutlery. We'll see lower decibel levels in the high-end models where you'd question if the machine is even on! There are different drying options to consider in high-end models, as well. To begin, Miele is consistently one of the most reliable dishwashers and brands purchased at Yale. This model comes with two different handle types. Towel bar handles or a recessed pocket handles fit seamlessly in any kitchen. You can even order a panel ready version to add a custom cabinet and handle hardware.  You can have three handle variations in just one model. Auto, quick washes, and an optional water softener make this model a stand out. Added versatility - Center section can be lowered and is equipped with a hinged row of spikes for cutlery items. Flexibility - Between the 3rd-row cutlery tray, silverware basket, and the adjustable top rack with fold down tines everywhere. You can also remove the entire back section to have a completely flat surface so accommodate oddly shaped items. There isn’t much you can’t fit inside of this model. What's interesting is that the bottom rack can be removed to load larger and odd-shaped items like bowls, pots, and pans, where the tines would get in the way. You'll have a full wash arm dedicated to the area, unlike the other two brands, freeing up space where there would typically be a basket. 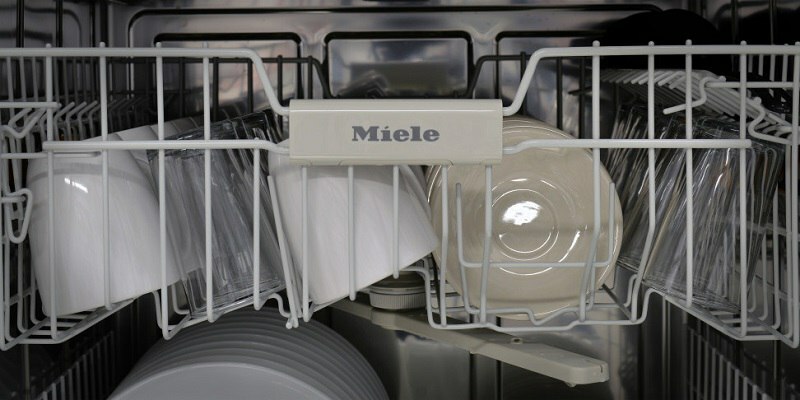 Miele has the best drying cycle with intake ports at the bottom of the dishwasher. 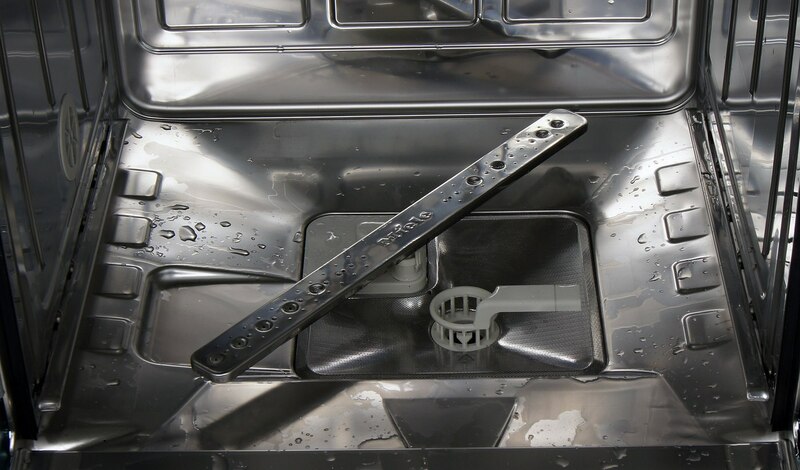 The "colder" air of your kitchen is directed to the outside of the dishwasher attracting the hot air inside the dishwasher and dissipating the steam to water. Note, that other models from the Miele Crystal EcoFlex Series are the G6665SCVI at $1499 and the G6665SCVI (Panel Ready) for $1,399. However, the best one from this series is ultimately the Miele G6625SCU (Pocket Handle) $1,499 which we described above. It’s a happy medium of value and features that touch the needs of a majority of consumers, and what they could ever want in a dishwasher. 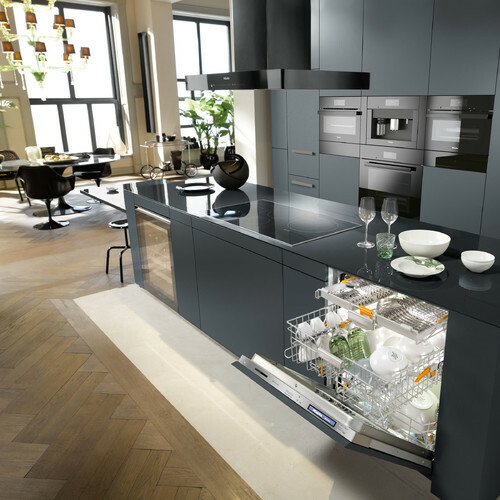 Miele has dishwashers up to $2,500 including more customized cycles and a cool knock to open feature. Tap twice and the dishwasher door opens. It will also have two air intake ports and will open automatically after the cycle to accelerate drying. Bosch, an enormous German-based company, has their appliance manufacturing division in the United States. They also own the largest dishwasher manufacturing factory in the world, based in North Carolina. 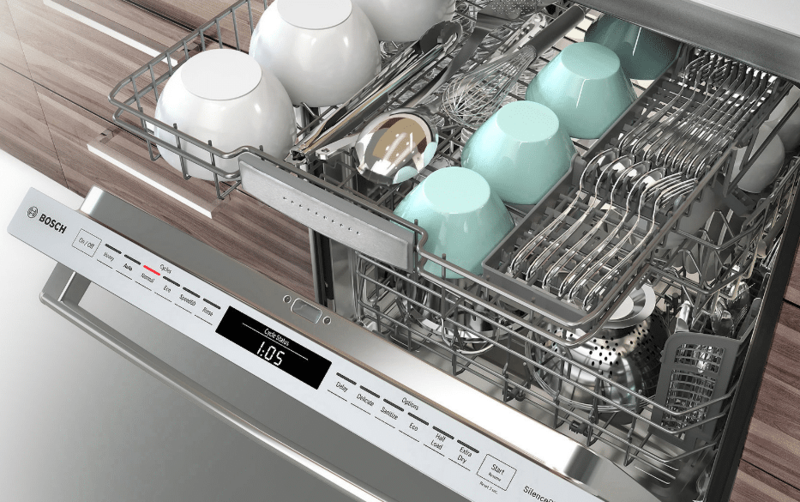 They were first to market with quiet dishwashers, stainless tubs, and integrated controls. 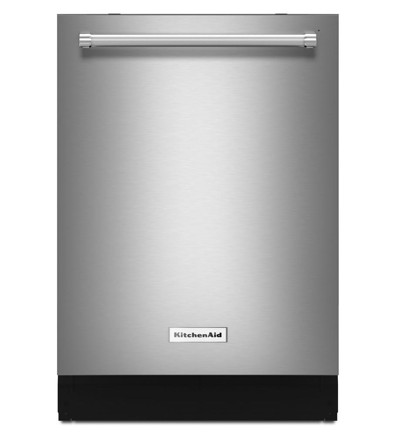 Bosch is one of the best affordable luxury brands with noteworthy features and style for less money. 16 place setting capacity - Maximum loading capacity! Bosch is a cycle-oriented machine. You have the main ones, but Speed60 is a 60-minute cycle designed to clean dirty dishes. The Sanitize option will boost the heat for better washing action. The new EasyGlide rack system provides a smooth glide for easier loading & unloading on all 3 levels and is less likely to cause strain on heavier loads. 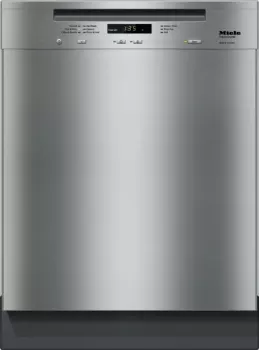 Bosch does have a more expensive dishwasher at $1,999 with even more customizable options as well as a lower DB rating. After years of being noisier than the comparable Bosch dishwasher, KitchenAid actually has the quietest dishwasher of the three. This isn't over $1000 now, but normally is. 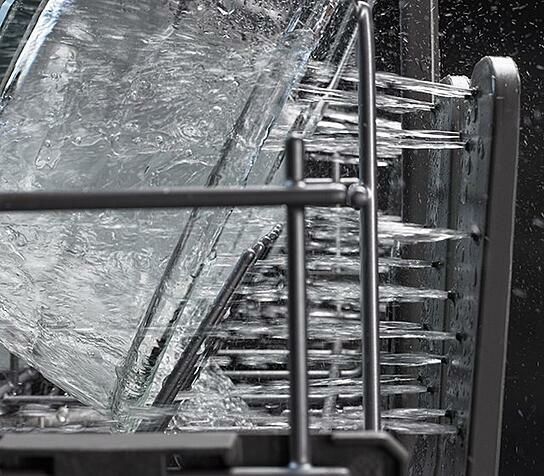 ProScrub and ProWash Options - the ProScrub uses 40 water jets to clean messes off your dishes leaving no residue while the ProWash cycle automatically tests the soil factor of the dishes and determines the required cycle. This model utilizes a heated dry versus the other two, which use condensation dry. The interior is deeper as well, making it more adaptable for larger families who may wash a bigger mix of things like baby bottles, bowls, and a little bit of everything else. As I said, KitchenAid is the quietest because they now employ a filter rather than their traditional grinder. The ProScrub has concentrated sprays for dishes that have food heavily baked on them. Like the Bosch and Miele, KitchenAid has a third rack and adjustable top rack. KitchenAid's more expensive dishwashers have a window. 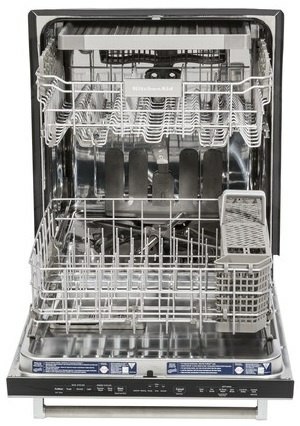 Unless you like the effect of seeing your dishes as they are being washed, this model is a much better value. This depends on what you want. In terms of quiet, KitchenAid is the best. At 39 DBs, it is unbelievably quiet. However, 45 DBs and below is silent. KitchenAid also offers the ProScrub. It is the best for dishes with food baked on. It is also $500-600 cheaper than the other two. Bosch is very quiet and affords you a tremendous amount of flexibility with different cycles. Miele is exceptionally reliable and has the best wash system with three levels, as well as, the best dry cycle. All three are good choices depending on what you like. Want to learn more about dishwashers? Download our free Dishwasher Buying Guide for detailed information on the best brands and features. Well over 250,000 people have read a Yale Guide.